One of the greatest miracles in Western cultural history happened within 20 years in Paris. The world hasn’t been the same since. We should all be grateful. When Louis XIV moved his court from Paris to Versailles in 1682, France was enjoying the fruits of his early finance minister, Jean-Baptiste Colbert. Under his tireless labors, shipbuilding increased, the wool trade grew, the army was modernized, and mines and foundries thrived. He thus helped build the economic backbone for what was to emerge next–the art of living well. Several things emerged at the same time to create one of Western culture’s most creative movements. 1. Fashion seasons. Everyone began to expect clothing styles to change every year. Women who were one step ahead were admired. Woe to anyone seen in last year’s rags. 3. Fashionable accessories, like handbags and umbrellas. 4. Mirrors. Venice made the biggest mirrors in the world, and its government jealously kept the craftsmen and their families on the island of Murano. French ships sailed undercover and the workers were offered much more money from the Sun King’s coffers for coming on board. What Venetian could refuse more pay? Paris suddenly could make the world’s largest mirrors. 5. Chandeliers. 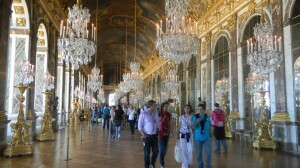 In Versailles’ Hall of Mirrors, they hung between the windows and mirrors. Together, they created dazzling reflections of light. 6. The diamond industry. Diamonds became the most precious gems in the late 17th century. They replaced pearls, rubies and emeralds. The 24 carat cut became the standard–it reflected the most light. The Sun King loved them, and he promenaded at Versailles in a suit of diamonds that was so heavy that it was hard to walk in. 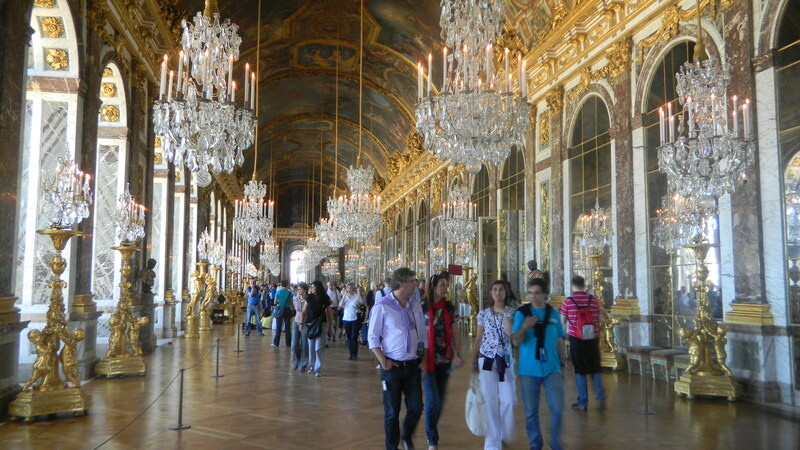 But it reflected all the more light in his Hall of Mirrors. Who could have doubted that he was The Sun King? 10. Shopping centers full of boutiques. 12. The catalog industry. All these fashions could now be announced in advance, with pictures that represented good living. Wants became more important than needs. Streetlights allowed people to safely shop, dine and display their clothing all evening. 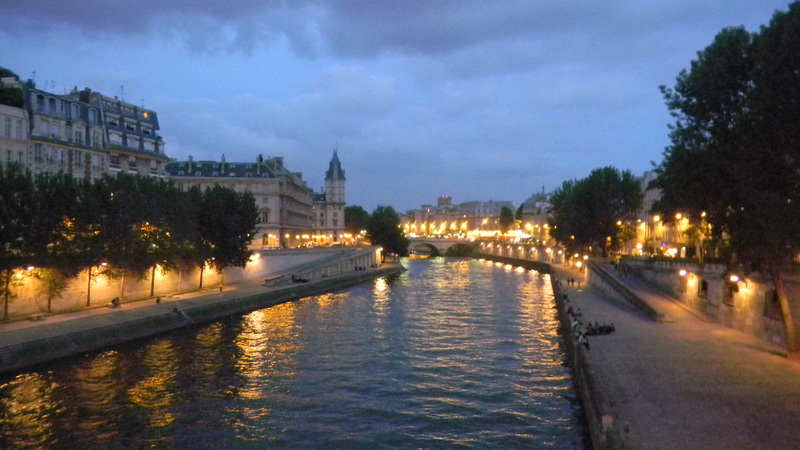 Folks began to say that more people live in London, but people live well in Paris. 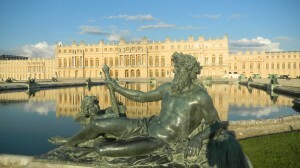 Catalogs and boasting travelers spread the mystique of French culture throughout Europe and to the New World. Paris seemed like the center of the universe to anyone with culture, as Beijing’s Forbidden City seemed at the opposite end of Eurasia. Both flourished in the late 17th century. But France soon went through several upheavals that strained her mystique. Would it survive? We’ll find out in Part Two. Joan De Jean’s book, The Essence of Style details the rise of modern Parisian culture very well.